Nearly a third of advisors planning to retire in the next 10 years are unsure about their succession plan, according to a new report. Baby boomer advisors—the largest generation and one that manages a third of all client assets—is nearing retirement, but many are still unsure of their own succession plan. Much attention has been paid to a generational transfer of client wealth, but a generational transfer is upon the wealth management industry itself. 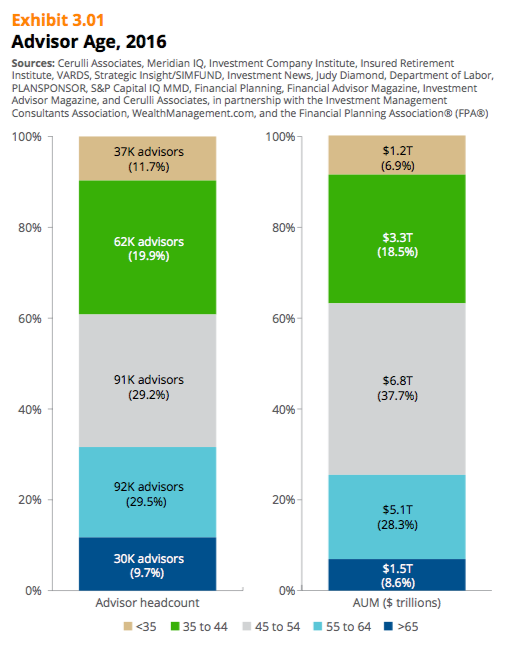 Advisors 55 years or older account for more than 39 percent of all advisors and manage 36.9 percent of all client assets, according to a report by Cerulli Associates titled U.S. Advisor Metrics 2017: The Next Generation of Planning. There’s a dearth of young advisors who will be positioned to inherit the businesses and clients that the baby boomers will leave behind. The average advisor is 50 years old, and only 11.7 percent of advisors are under age 35, the report said. And while awareness of the issue is increasing, nearly a third of the advisors planning to retire in the next 10 years (28 percent) are unsure about their succession plan. The report also noted that the wirehouse brokerages have done a better job than other channels in preparing for the transfer by partnering rookie advisors with experienced brokers. More than 40 percent of wirehouse advisors within 10 years of retirement indicate that an existing advisor in their same practice will be their successor, compared to only 27 percent across all advisor channels, according to Cerulli. And 23 percent of wirehouse advisors plan to transition their practice to a junior advisor or a family member.